Milk Presents’ Production Manager Al Orange shares some thoughts about the development of Bullish, which comes to CPT in October and headlines our new festival Come As You Are. Working with Milk Presents brings forwards particular challenges for a Production Manager. The process sits somewhere on a constantly moving scale between, devised and scripted work, as delightfully non-binary as the team responsible for creating it. The work is constantly being re-assessed and refined, and sometimes completely redefined, even over the course of a few days. This makes my job as fluid as everything else around me, sometimes I am kicking my heels, unable to move forward as I know that everything could change overnight. Sometimes I have to do an incredible amount of stuff within a very short time frame. This can be quite stressful at times, but over the last year I have found a new outlet which helps me retain my equilibrium. between worlds, neither one thing or the other, and I found myself wanting to play with that visual image as well. 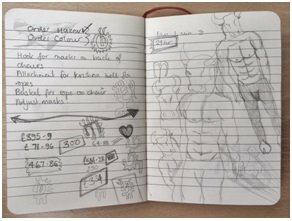 In those moments of waiting for clarity, I started sketching minotaur images in my notebook alongside financial calculations and reminders to order lighting gel. 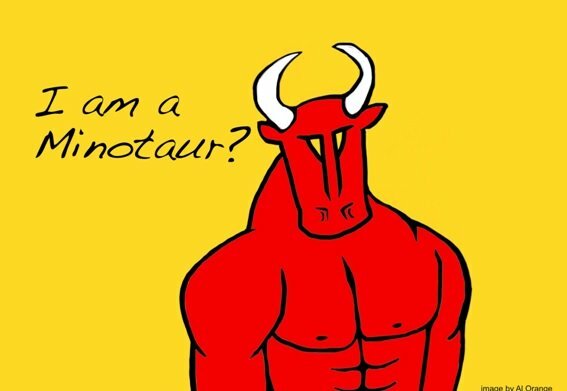 that reflects these questions, so alongside the development of the play, I have been searching for my Minotaur, and the ways in which I can bring them to life. Something that comes up time and time again is how our Minotaurs are not only fighting the outside world, but also fighting aspects of their own personality. 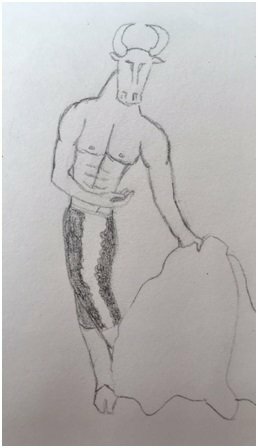 From this I became fascinated by the image of my Minotaur as a matador, fighting against the enemy within, a hero who also has the capacity to bring about their own destruction. But how to present this particular non-binary beauty? I’m still searching, still sketching, still hoping I will find them. I think I want to show them at the end of their fight, triumphant but exhausted, defiant but already bracing themselves for the next fight. Whoever they are, they are complex and a true challenge to represent. After our preview show at Departure Lounge in Derby in July, the piece of feedback I heard most often, was that the work was layered and contained real depth. That is important to us. Our characters need to be more than a snapshot in time of one person’s experience. So, as we continue to work on the show, all of us are still searching for our Minotaurs. Come along to Camden People’s Theatre in September, and see who we have found. You might even get to see a painting.